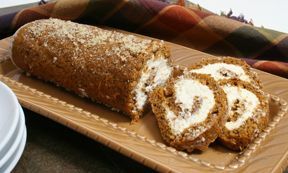 This pumpkin dessert is not only filled with pumpkin flavor, it also looks beautiful on the holiday table. Grease a 15x10 jelly roll pan and line it with wax paper. Grease and flour the paper. Lay out a tea towel and sprinkle with powdered sugar. Combine flour, baking powder, baking soda, cinnamon, cloves and salt in a small bowl. Beat eggs and sugar in a large bowl until thick. Spread into prepared pan and sprinkle with nuts. Bake for 13-15 minutes or until the cake springs back when touched. Loosen the cake and turn out onto the prepared towel. Carefully peel off the paper. Roll the cake and the towel up together, starting with the narrow end. Beat the cream cheese, powdered sugar, butter and vanilla in a small mixer bowl until smooth. Carefully unroll the cake removing the towel. Spread the cream cheese mixture over the cake. Wrap in plastic wrap and refrigerate at least one hour. Sprinkle with powdered sugar and chopped nuts before serving.